Ohio senior Andrew Meyer (9) shakes off a Bison defender, during the Bobcats’ 38-32 victory on Saturday at Peden Stadium in Athens, Ohio. ATHENS, Ohio — Not a perfect start, but in the end it’s a win. 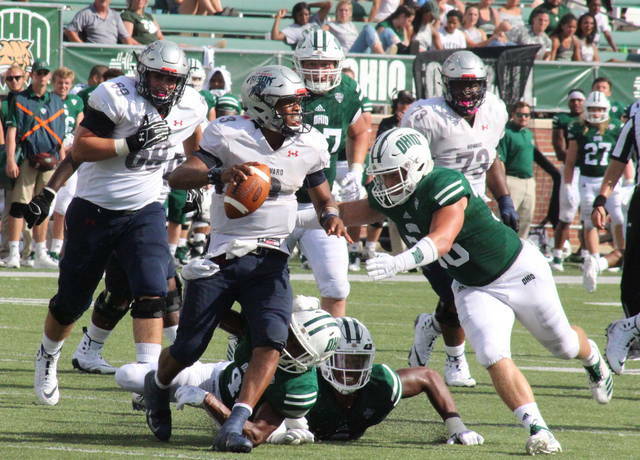 The Ohio University football team allowed FCS guest Howard University to chalk up 645 yards of total offense in Saturday’s season opener at Peden Stadium, but the Bobcats won the turnover battle by a 4-0 count and held on for a 38-32 victory. The Bison (0-1) took a 7-0 lead with 12:50 left in the opening period, as sophomore quarterback Caylin Newton scrambled in from four yards out. Faraji Joseph added the point-after, and at the 5:06 mark in the quarter, he hit a 26-yard field goal to give the guests a 10-0 advantage. The Bobcats’ ensuing drive covered 70 yards in 13 plays, but they settled for a 22-yard Louis Zervos field goal with 1:00 left in the first quarter. Howard pushed its lead to 16-3 with 9:37 to go in the second quarter, as Newton connected with Jason Collins for a 38-yard touchdown pass. Ohio found the end zone for the first time with 4:54 left in the half, as Quinton Maxwell tossed an 11-yard scoring pass to Papi White. Zervos’ extra point cut Howard’s lead to six points and capped off the six-play, 78-yard drive. HU got six of the seven points back at the 1:47 mark of the quarter, as Newton found Kyle Anthony for a six-yard scoring pass. The Bobcats had enough time to answer, as they covered 75 yards in seven plays and 1:08, with Maxwell finding Cameron Odom for a 13-yard touchdown with 39 seconds left in the half. Zervos added the point-after, cutting the Bison lead to 22-17 headed into the half. Ohio’s D.L. Knock brought the second half kickoff back 99 yards for six points, with Zervos adding the PAT — his first of three successful in the second half — to give the Bobcats a 24-22 lead. Just 1:37 later, Ohio was in the end zone again, this time Maxwell kept it himself and punched into the end zone from one yard out. The Bison cut Ohio’s lead to two points with 4:47 left in the third, as Newton tossed a 55-yard touchdown pass to Jequez Ezzard, and Joseph made the PAT. 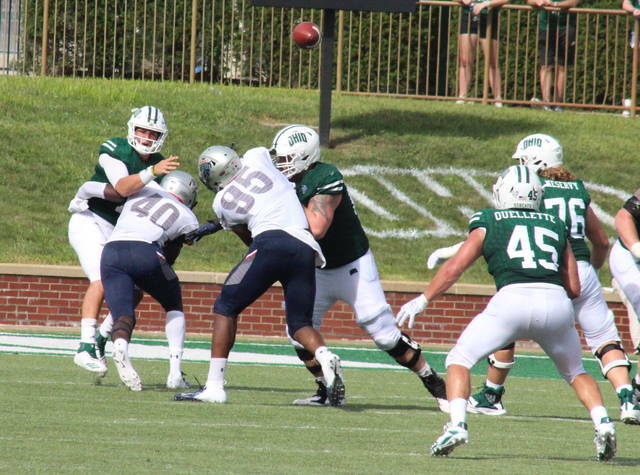 The Bobcats gained some breathing room seven seconds into the fourth quarter, as Maxwell scrambled in from 10 yards out to make it a 38-29 game. The Bison cut their deficit to 38-32, when Dakota Lebofsky made a 40-yard field goal with 7:46 left, but HU couldn’t score again and OU claimed the six-point win. 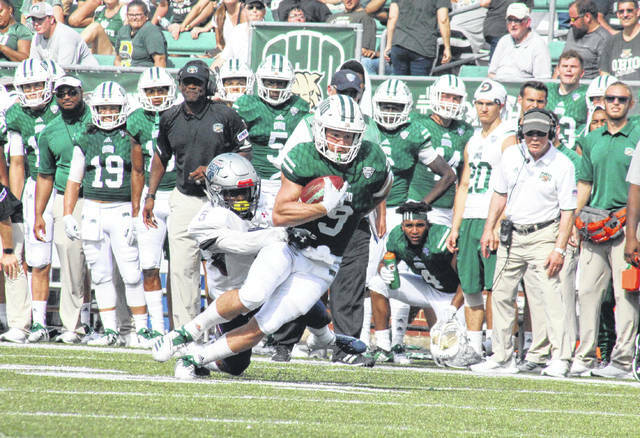 Following the game, 14th-year Ohio head coach Frank Solich acknowledged that the Bobcats will take the win, but still have plenty of areas to work on. “Well I’m pleased with the win, wins don’t come easy,” Solich said. “I don’t think we played especially well on either side of the ball. When you give up as many yards as we did, you don’t win football games that way. We have a lot of work to do defensively, no question about it. That doesn’t mean we don’t need things going on the offensive side too. Howard earned a 645-to-423 advantage in total offense, including a 484-to-277 in the passing game. 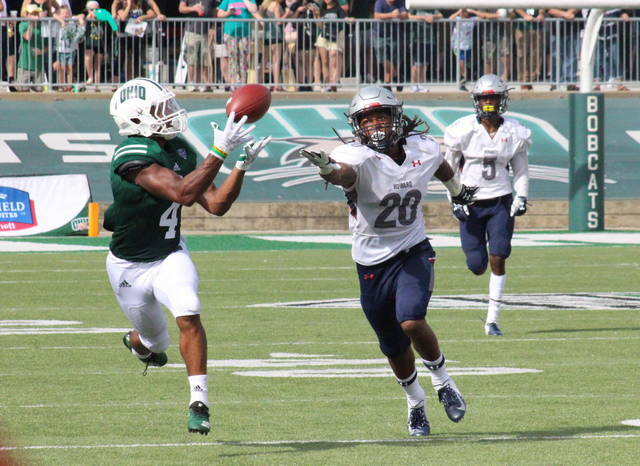 HU also earned a 26-to-22 edge in first downs, with the Bobcats going just 4-of-15 on third down. Ohio was penalized five times for a total of 50 yards, while Howard was sent back eight times for 71. Maxwell was 17-of-25 passing for 233 yards and two touchdowns, to go with eight carries for 21 yards and two more scores. Ohio starting quarterback Nathan Rourke was 2-of-8 for 44 yards, and carried the ball five times for a total of 16 yards. A.J. Ouellette led the Bobcat ground attack with 59 yards on 17 carries, while Maleek Irons added 52 yards on nine totes. White led the Bobcat receiving unit with eight catches for 154 yards and one score. Odom had three grabs for 48 yards and a score, Ouellette and Andrew Meyer both had three receptions for 26 yards, while K.J. Minter and Ryan Luehrman had a catch apiece, gaining 15 and eight yards respectively. On defense, Ilyaas Motley and Evan Croutch both intercepted a pass, while Cole Baker and Sam McKnight combined for a sack. Kylan Nelson and Jalen Fox recorded seven solo tackles apiece to lead the Green and White. Fox forced and recovered a fumble, while Croutch had a team-best 1.5 tackles for a loss. For Howard, Newton was 26-of-52 passing for 439 yards and three touchdowns, with two interceptions. He also led the team on the ground with 21 carries for 93 yards and a touchdown. Anthony recorded a game-high nine receptions, totalling 97 yards and one touchdown, while Ezzard had eight catches for 223 yards and a touchdown. Zamon Robinson earned a game-best two sacks, while Allison Marcell recorded nine solo tackles for the Howard defense. The Bobcats will have a week off before invading Virginia on Sept. 15 for a battle with Cavaliers.